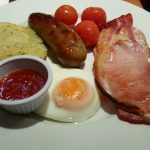 When you´re staying in Dublin you have to try a full Irish breakfast at least once. 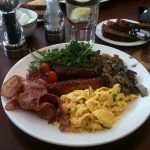 It´s just delicious and a really good comfort food which will be the perfect start for your day. 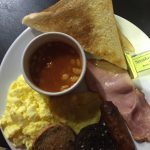 You can find it in various cafés and restaurants in Dublin and it´s also known as a good hangover cure. 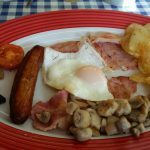 A full Irish breakfast usually includes bacon, sausages, eggs (scrambled, fried or poached), white & black Pudding (meat and oatmeal), fried tomato, baked beans, sauted mushrooms and toast. You will definitely be full afterwards! The Irish like to drink, of course, a cup of black tea with it, but many restaurants also offer coffee as an addition. 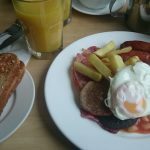 In this post you will find some of the best restaurants and cafés to enjoy an amazing full Irish breakfast in Dublin. All of them also have good Yelp ratings which you can find in the description of each one. The prices stand for one full Irish breakfast. 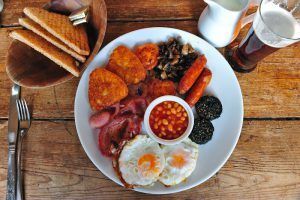 Enjoy your full Irish breakfast in Dublin!! This entry was posted in Dublin experience, Dublin life. Bookmark the permalink.